Yunel Cruz: Artist, Entrepreneur and Protector of the Environment. On March 23, GFDD/Funglode welcomed Fernando Villalona, el Mayimbe, one of the most famous and emblematic artists of the Dominican Republic, who took the stage at the Miami Dade College to reflect on his life and 45 years music career and achievements which have included more than 20 albums covering numerous musical styles such as merengue, cumbia, bachata, boleros and ballads. For the second Dominican Get Together, the Dominican and Latin community and lovers of Dominican culture turned “outside and inside” to be part of an intimate gathering with the famous singer Milly Quezada, who very pleasantly shared anecdotes about her life and her career with the audience. The Queen of Merengue dazzled the public with her stories and her music on April 21 at the Symphony Space Theatre, in New York. Read more about Fernando Villalona's DGT. Read more about Milly Quezada´s DGT. A total of 12 days of films, discussions on environment, work meetings and passion; passion for the cinema, for sustainable development and alternative ways of living for a healthier coexistence with our neighbors and the planet. 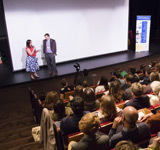 For the fifth consecutive year, the Dominican Republic Environmental Film Festival (DREFF) teamed up with the DC Environmental Film Festival (DCEFF) and participated to the fullest in the screenings and events that took place in the nation’s capital. Among the activities, Natasha Despotovic, executive director of GFDD and DREFF, shared a panel with other renowned female filmmakers at the Women in Film and Video breakfast. Moreover, la Noche Dominicana (Dominican Night) was a total success. Members of the Dominican community in Washington, film buffs, and environmental activists filled the packed room in a double celebration: for both the Dominican environmental film and of the DR’s extraordinary biodiversity. A posthumous tribute was given to the director Máximo José Rodríguez during the event. In addition to being a great friend and collaborator, Rodriguez was a member of the DREFF National Advisory Committee. Celebrating Recycled Art in NYC! The ReCrearte program organized a series of workshops throughout the city of New York in March in which children and adults learned about repurposing discarded materials into new objects and works of art, and about the three R’s of sustainability- reduce, reuse, and recycle. Three Dominican environmental short films were screened at the “Festival Internacional del Cine Pobre” in Gibara-Holguin, Cuba, held from April 20 to 24, 2016: GFDD’s shorts Value of Life and Garbage or Resource? A Dominican Republic Experience; and 7 Grams (winner of the Premio Globo Verde Dominicano 2015). In addition, as part of the programming of the Cuban festival, Bertha Santana hosted recycling workshops for children, youth, and adults in the community, as part of GFDD´s program ReCrearte. GFDD through its program RDescubre and in collaboratation with Plan Lea, within the framework of the Week of Geography, organized a visit to “Parque Nacional Lago Enriquillo e Isla Cabritos”, where participants had the chance to observe the main species of flora and fauna endemics of the region and to perceive the alterations suffered by the Lake as consequence of climate change. 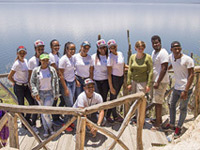 More than 40 young students, professors, and staff from different academic institutions had the opportunity to attend the expedition to the area known as “Las Caritas”. Previously the group of students attended the screening of the documentary Lago Enriquillo: Preludio del cambio climático, by Fernando Báez, organized by DREFF’s Year Round Environmental Film Screenings Program. Watch here the interview to last year´s Globo Verde Dominicano winner. 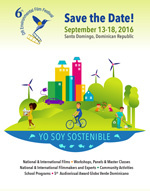 Value of Life (Valor Vital), GFDD/DREFF's most recent short film production, will be screened at the conference "Efectos del Cambio Climático a nivel mundial y en República Dominicana" (Climate Change Effects in the World and in the Dominican Republic), on May 5, 2016, in Santo Domingo. This event is organized by FUNIBER (Fundación Universitaria Iberoamericana), a GFDD/DREFF's partner in the Dominican Republic. When: Thursday, May 5, 2016. 5:00 - 8:00pm. Global Foundation for Democracy and Development (GFDD) / FUNGLODE will present on May 5 and 6, in Santiago de los Caballeros and in New Jersey respectively, its latest publication, LO DOMINICANO / ALL THINGS DOMINICAN. A book that compiles 5 years of research and presents the essence of the Dominican Republic through fun facts, images and perhaps unknown information to the new generations. GFDD and the Embassy of the Dominican Republic in the United States will join forces to present the very best of the Dominican Republic during the 2016 Around the World Embassy Tour, a signature annual event in Washington, DC part of the PassportDC initiative. When: Saturday, May 7th 2016. 10am - 4pm. GFDD will be introducing its program to the New York Community at the Annual Community Health & Resource Fair. The event will include raffles and giveaways and fitness workshops. Children will be able to enjoy face painting and a bouncy house. All community members are invited. Let’s Salsa at the Ibero-American Film Showcase 2016! The IberoAmerican Cultural Attache's Association (AACIA) is organizing the Ibero-American Film Showcase 2016, from March 30 to May 11, 2016. On May 10, GFDD and the Embassy of the Dominican Republic in the United States are presenting together the Dominican documentary "Yo Soy la Salsa", original idea and production of Andrés van der Horst Alvarez for Charanga Films. When: Tuesday, May 10, 2016. 6:00 p.m.
Where: Movie Theatre of the Colombian Embassy in Washington, DC. 1724 Massachusetts Ave NW, Washington, DC 20036. This event is free and open to all audiences! Friday, June 3, 2016, 5:30pm: La Montaña. Friday, October 7, 2016, 5:30pm: Details coming soon! Save the date! Friday, December 2, 2016, 5:30pm: Details coming soon! Save the date!